This Healthier Easter Recipe for Kids, see the pictures(! 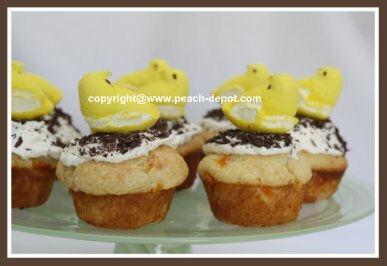 ), is very easy and makes fun Easter muffins with peeps for the perfect Easter Breakfast or Brunch. with no extra cost to you. Healthier Homemade Easter Treats for Kids! 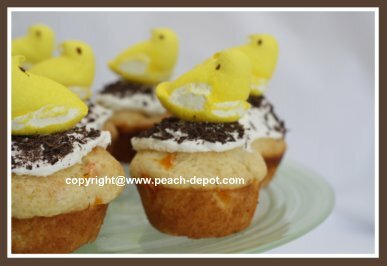 The ingredients for these muffins includes canned peaches, however, if you are fortunate enough to have fresh peaches on hand, they will work fabulously as well! Finely chop the drained, canned peaches. In a large bowl, stir together the flour, baking powder, salt, and the sugar. In a small bowl, lightly beat the eggs, then beat in the buttermilk and the oil. Make a "well" in the center of the dry ingredients, and pour in the beaten liquid ingredients. Gently stir in the chopped peaches, just until combined, do not overmix. Spoon the muffin batter into greased, (I used non-stick cooking spray), or paper lined muffin cups. Baked at 400° F for about 20 minutes, or until well risen, golden brown, and firm to the touch. Let the muffins cool for about 5 minutes in the pan, and then remove muffins to a plate until cooled. Using the vanilla icing, top each muffins generously with the icing. 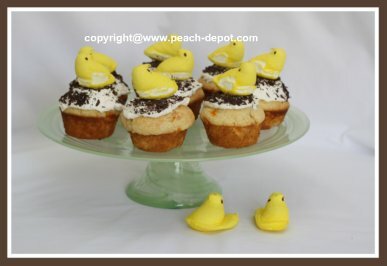 Sprinkle chocolate shavings on top of the icing, and add a marshmallow "peep" to the top of each iced muffin. 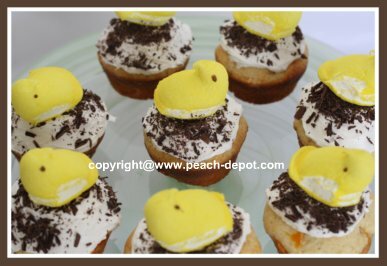 Interested in more ideas for Easter Recipes for Kids? Do you love pedestal cake and pastry stands like I do? Check out the link below to see my favourite choices! I ♥ LOVE my Easy-to-Use Knife Sharpener! ~ I don't know how I did without a knife sharpener for so long! Here (below) is the one I have had for the past 10 years! no extra cost to you. ... It's like using a blender ! of the Ribbon on the Pastry Stand Below...fun!